This week, as requested by one of our fans on facebook, we will be looking at a truly intimidating carnivore that has distant ties with us humans. Make way for Pampaphoneus biccai! Pampaphoneus lived in what is now Brazil during the middle Permian Era, about 260 million years ago, tens of millions of years earlier than the first dinosaurs. When alive, because of its teeth, scientists believe Pampaphoneus was a meat-eater, possibly hunting other reptiles it coexisted with. Pampaphoneus is only known from one skull but by comparing its proportions to more complete relatives on the fossil record, its snout to tail length can be estimated somewhere between four and six feet long. The name, Pampaphoneus, translates to "killer from the Pampas" in reference to the area of Brazil in which the fossil was discovered. 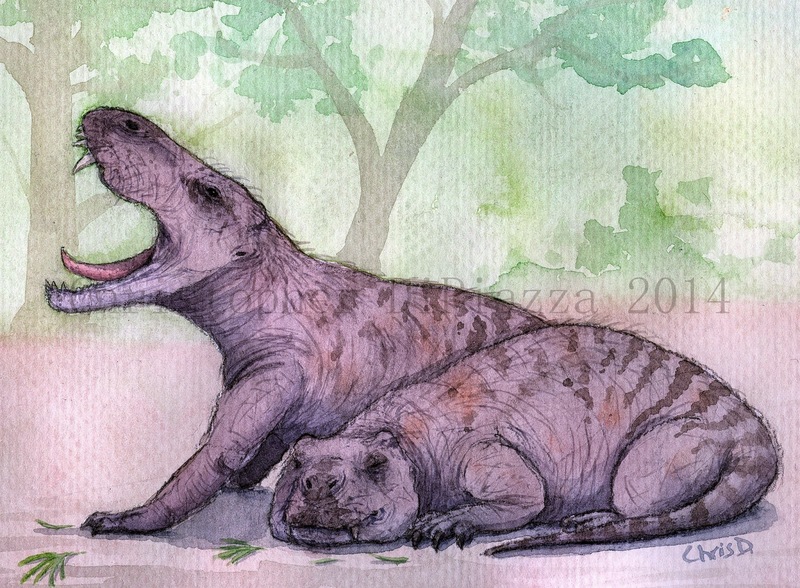 Life reconstruction of two Pampaphoneus getting up from a snooze by Christopher DiPiazza. Visually, Pampaphoneus is difficult to place compared to animals that are alive today. 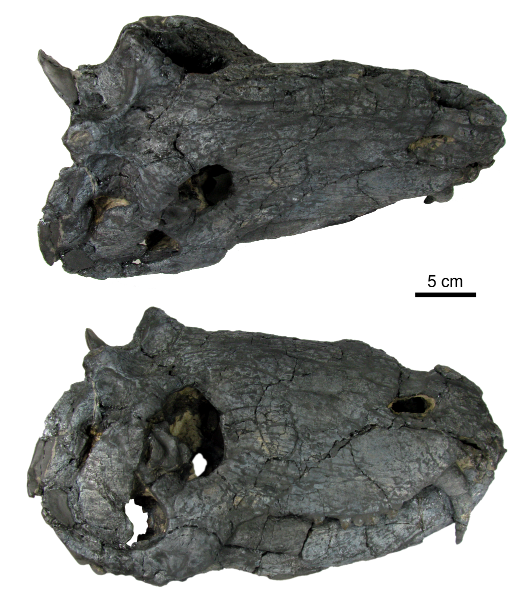 It was clearly reptilian but it has some striking mammalian features as well, especially in its teeth. This is because Pampaphoneus was a kind of dinocephalian. Dinocephalians are considered "mammal-like reptiles" and illustrate one of the branches of the reptilian family tree that was on its way to becoming mammals. These peculiar creatures came in a variety of sizes and shapes during the middle Permian. Some ate plants, others ate meat, most had some sort of knobby protrusions on their skulls, and many of them had long teeth. By human standards they were pretty ugly, not gonna lie. Ugly in a beautifully fascinating way, though! Sadly, dinocephalians never actually made it that far, however, having disappeared from the fossil record pretty abruptly around 260 million years ago, but the Permian Era was full of other mammal-like reptiles, which would eventually give rise to true mammals like us hundreds of millions of years later. The very famous, Dimetrodon, is another kind of mammal-like reptile, but is not a dinocephalian. Pampaphoneus is interesting because it is the only dinocephalian found in South America. All other known dinocephalians are from either South Africa or Russia. This tells us that during the Permian era, these mammal-like reptiles had to have had a way to disperse from continent to continent. They were able to do this quite easily because back then, the seven continents we have now were actually joined to form one massive land mass, called Pangea. Finding similar fossils on different continents helps scientists map out closely how the continents at one point were joined together and how long ago they separated. That is all for this week! Join us next time for another Prehistoric Animal of the Week! As always feel free to comment below or on our facebook page! Angielczyk, K. D. (2009). "Dimetrodon is Not a Dinosaur: Using Tree Thinking to Understand the Ancient Relatives of Mammals and their Evolution". Evolution: Education and Outreach 2 (2): 257–271. doi:10.1007/s12052-009-0117-4. Cisneros, J.C.; Abdala, F.; Atayman-Güven, S.; Rubidge, B.S. ; Şengör, A.M.C. ; Schultz, C.L. (2012). "Carnivorous dinocephalian from the Middle Permian of Brazil and tetrapod dispersal in Pangaea". Proceedings of the National Academy of Sciences of the United States of America 109 (5): 1584–1588. doi:10.1073/pnas.1115975109. It might have had a full coat. Or no fur at all! Permian synapsids are a mysterious bunch still.